Union Bank launched a comprehensive portfolio of Credit Cards, powered with VISA payWave , adding greater versatility and vibrancy to its Retail Banking product offering. The introduction of contactless Credit Cards signifies and endorses Union Bank as one of the fastest growing Banks in Sri Lanka transforming its ambitions in the Retail Banking business, and offering a one-stop solution for all financial needs of its customers. Union Bank Credit Cards are launched under Gold, Platinum and Signature card propositions. The Credit Cards have been designed around the needs of the client segments giving special care to the lifestyle needs identified in the bank’s strategic customer segmentation approach with a wide range of offers, benefits and unique features. Union Bank is the first Bank to go live with all its cards powered with VISA payWave’ which would place these cards amongst the most sophisticated plastics in the industry, that are well adoptable to the ongoing digital transition in the industry. Visa payWave will facilitate greater convenience to cardholders with faster checkout at Visa payWave enabled points-of-sale. The range of Credit Cards are offered at competitive rates of interest, making them the most economical gateway to an array of premium lifestyle benefits and privileges. 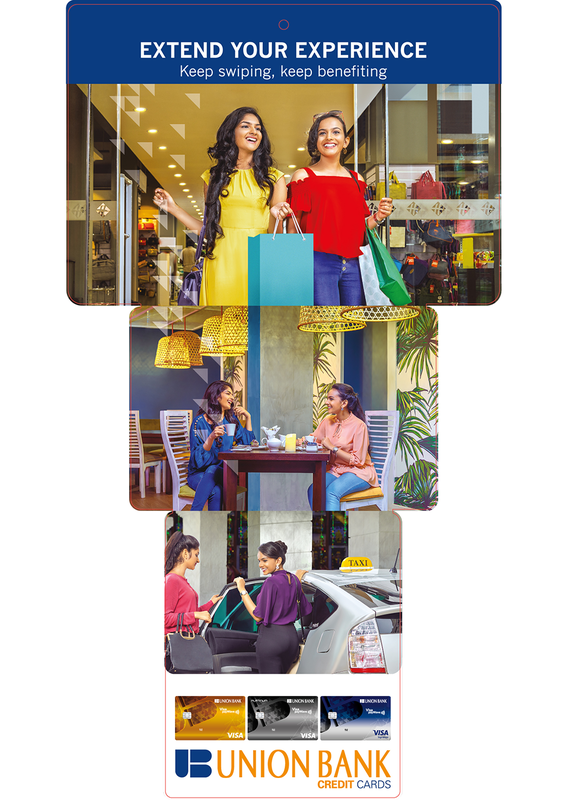 Union Bank Credit Cards come with payment-plan options that include an attractive balance transfer opportunity starting at zero percent, greater financial freedom with 0% instalment plans for high value purchases from leading retailers, and a distinct rewards scheme that enables cardholders to earn as they spend. Union Bank Credit Cardholders will enjoy the convenience of managing their card online through the Bank’s mobile app and internet banking providing greater convenience at the finger tips from anywhere in the world. The Cards are empowered with an instant cash withdrawal option up to 50% of the credit card limit to facilitate urgent cash requirements and any emergency. Card repayments are facilitated through any online banking system without compromising the card or having to use the Card number exposing it to unforeseen phishing attacks. Union Bank Signature cards are exclusively designed for the high net-worth clientele to deliver exclusive lifestyle offers and privileges that deliver opulence and luxury to complement their lifestyle. Having identified the significant lifestyle needs of the diverse client segments which the Bank aims to serve, Union Bank Credit Cards have been enriched with a gamut of year-around offers that are well positioned to enhance the experiences of its users and enrich their lives with valuable savings on daily essentials , dining, fashion and retail experiences, entertainment, holiday and travel. Credit Cards are available across the Bank’s island wide branch network and inquiries could simply be made online or through the Bank’s 24 x 7 contact center hotline on 011 5800 5800 to avail of a personalised service by a dedicated sales personnel. More information on the Union Bank Credit Cards and other products and services of the Bank can be accessed at the Bank’s corporate website via www.unionb.com.